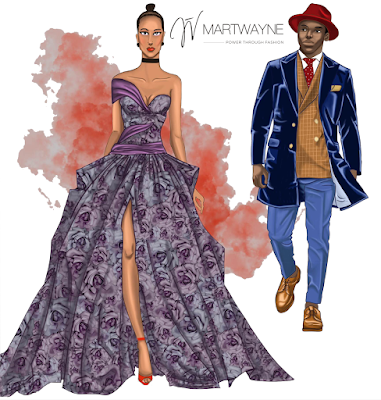 Martwayne | Power Through Fashion: Learn Fashion Design, Fashion Illustration & Computer-Aided Design this February @ Martwayne and take your love for fashion to the next level! 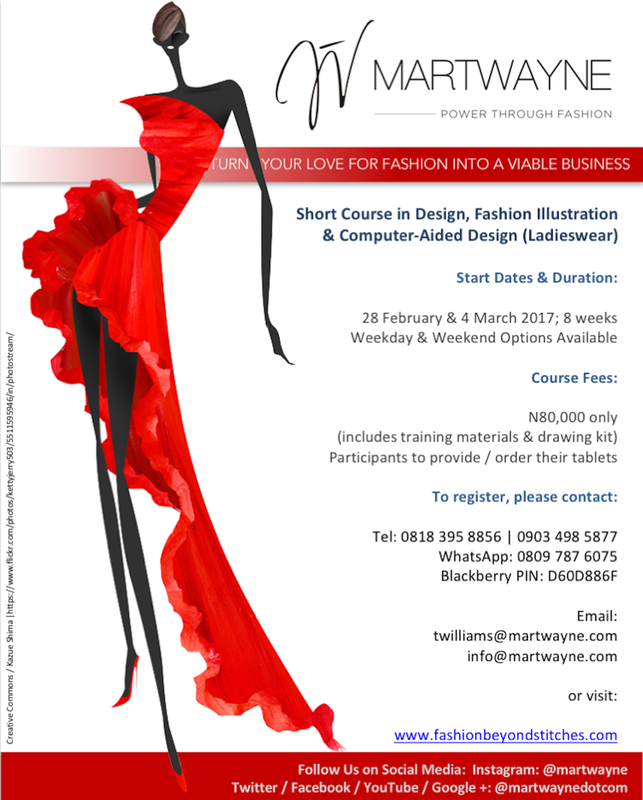 Learn Fashion Design, Fashion Illustration & Computer-Aided Design this February @ Martwayne and take your love for fashion to the next level! This month, we are teaching the CREATIVE side of fashion and our first and really popular course is the Design, Fashion Illustration with Computer-Aided Design Course. This Course is perfect for you if you love fashion and want to explore your inner creativity. - Have you always wondered how people come up with the most amazing designs? - Do you have all these awesome ideas but just cannot seem to put them on paper? - Maybe you are tired of copying people's designs and want to come up with yours so people can patronize your work. - Your tailors keep wrecking your ideas because no matter how much you "explain" it to them, they just cannot seem to get it?! - You keep getting cut out of the final shortlist of candidates in that fashion competition because your fashion sketches were not up to par. If you fall into any of these categories (and trust me, the list is even longer than this), then this Course is for you! This Course focuses on the real ART of fashion design! Yes! This is where the work really is! - I am not creative, can I start a fashion business? - I applied to a fashion school but I was asked to submit a portfolio, what is that?! - Why do my tailors keep spoiling my work? - How do people come up with all these amazing designs? FRET NOT! You are in the right place! And the best part is, we teach FROM SCRATCH! So whether you are a complete beginner OR you are a good illustrator but wish to enhance your skills, this Course is for you! Goodness! Wouldn't you love to learn how to draw like this?! I often tell people that if customers give you a magazine to copy, then I doubt they consider you a designer at all. And that is where a lot of designers I chat to have found themselves. And this is simply because, without a portfolio, you cannot get your customers to choose from your designs. It is just that simple! The Course in in 3 parts! Yes! One Course, 3 different parts! - how to develop and defend your fashion collection. - Clothing the Fashion Figure. This is the portion where you learn how to perform the magic on your designs using CAD - turning your manual illustrations from drab to fab! And you know what the best part is?! You can choose to do all 3 parts (which is of course what I would advise) OR decide which of the parts you want to learn based on your level of experience, your finances or your time. So say, for example, you already know how to sketch beautifully but all you want to learn is how to use CAD to add that extra oomph to your designs, you can just register for Part 3! Yes! It is really that simple! Why pay to learn what you already know right?! SO what are the benefits of the Course you ask?! Well first, you never know what you are capable of until you are pushed! Yup! Our students never knew they had it in them but they pushed themselves and they aced it! I recall a previous class where a student whose project I initially rejected, repeated it and came up with an AWESOME collection based on medical injections - just in time for an exhibition in Italy! I was blown away! In another class, we actually discovered that a student got her target market wrong based on her designs. She thought her target market was aged 24 - 35 whilst her designs showed she should have been targeting a market for sophisticated women aged 40 and above. Without this exercise, she would have been frustrated and would have made made ZERO sales because she would have been marketing her work to the wrong people. It was a real eye opener. PLUS! 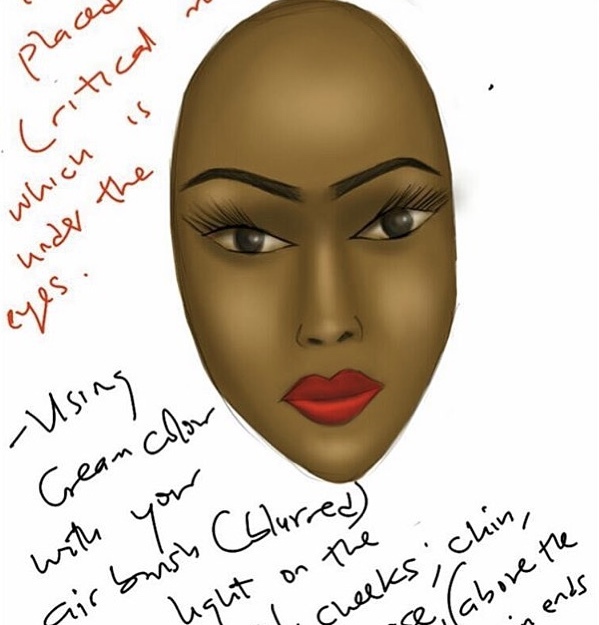 You are actually on your way to starting a new career in fashion illustration, establishing yourself as a fashion illustrator who designers can patronize! Easy! A previous student just resigned her job to focus on fashion illustration as a career and I have already referred people to her! So really, you will make your money back easy! So the Course goes beyond just you learning how to draw! It helps you know who you really are as a fashion designer and if you love fashion sketching, then you can easily establish yourself as one! PLUS you also learn the value of learning from constructive criticism. Trust me the Course is the ISH! The Course begins on 28th of February & 4th of March, 2017. We have a weekday and a weekend schedule. So yes! If you have a full-time job or you live outside Lagos, you can still register for this Course which will happen on Saturdays only (2 sessions a day for 8 weeks from 10am to 6pm). Weekday students who have a more flexible schedule can attend classes on Tuesdays and Thursdays for 8 weeks from 12 noon to 4pm. Here is the breakdown of the fees based on whichever option you choose to register for! Please note that most options include your training materials (except otherwise stated) but exclude your tablet if you are running the CAD option. This lasts 8 weeks for both the weekday and the weekend schedules and the fees are N80,000 only! BUT you will need a tablet for the Course. If you have your tab like an iPad or a Samsung, then that is great! Just come with it. As long as you can download the software, you are good to go! BUT if you do not have a tab, then you can order a graphic tablet from us which you need to connect to your laptop. You should budget about N30,000-N35,000 for the tablet but the actual fees will depend on the cost at that point and the exchange rate. But it should not exceed this amount! If you use a Windows 10 laptop, please contact us before you register! The fees are N35,000 and it lasts 2 sessions. For weekday students, this is one week, for weekend students, this is 2 weeks (one session per day). Option 3: Fashion Illustration with CAD (Parts 2 and 3). You will need your tablet or you can buy one. The duration is 6 weeks for the weekday option and 8 weeks for the weekend option. The times vary and your Course Calendar will have the details. Either option costs N50,000 only. If you are running the Fashion Illustration Option only, you will have to pay an additional fee for your drawing kit and if you are running the CAD option only, you will need your tablet or buy a digital tablet from us. Duration is 3 weeks for the weekday schedule and 6/7 weeks (1 session per day) for the weekend schedule depending on the Course. Your course calendar will list the details. Either option costs N60,000 only. Weekend schedule: 6/7 weeks depending on the option. This will be confirmed on your Course timetable. Please contact us when the transfer has been done so we can get your materials ready before the day. Join us on the day at the scheduled time prompt! We always start early so please be here early! 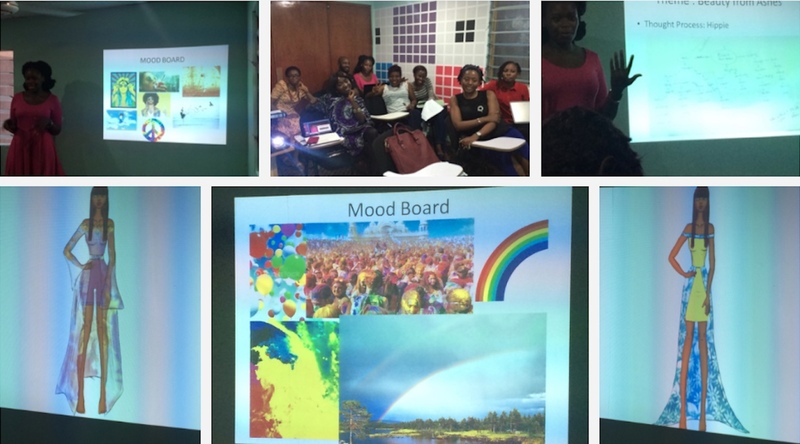 All classes take place at our Training Center in Surulere - Lagos - about 2 minutes from the National Stadium before you get to Alhaji Masha Roundabout. If you have any question whatsoever, do contact us as well. Great! That's it! Thank you so much! We can't wait to have you on the Course!